Sea Salts have been known since antiquity to relax sore, tired muscles and smooth and soften skin, while relaxing the mind and body. The History of Salt/Mineral Baths used for Health Benefits is extensive. Hydrotherapy or Hydro-thermal Therapy is a traditional method of healing, used for centuries by many ancient cultures in the treatment of disease and injury. Therapeutic baths were considered a standard healthy treatment for the body & it’s common ailments in ancient Rome, China, and Japan. Ancient Greeks took therapeutic baths on a regular basis or whenever possible. Therapeutic baths, using natural salts or geothermal mineral water are also documented in America, where Native Americans strongly revered certain areas with geothermal activity, such as the Yampah Vapor Caves & Mineral Hot Springs in Glenwood Springs, Colorado, as a wonderful healing source. During a Himalayan Salt Bath, or “Sole Bath”, toxins stored in the body are released into the bath water through osmosis, while the minerals contained in the salt are absorbed through the skin, reducing the acidity in the body and balancing the pH factor of the skin. This process leaves skin feeling fresh, clean and rejuvenated and may also help reduce Acne and other common ailments of the skin, such as Psoriasis. Salt Air Therapy is the process of breathing air containing dry, microscopic salt particles which travel to all areas of the lungs providing a natural way to cleanse and maintain the respiratory system from within. This all natural, safe and effective therapy helps to reduce inflammation in the airways effectively reducing constriction in the sinuses and lungs that can occur with colds and flus, as well as asthma, allergies and other sinus conditions. By helping the body to naturally eliminate allergens and pollutants, Salt Air Therapy also helps to support the body’s immune system. This treatment is most effective when large quantities of time are spent inhaling dry salt air. Due to its rather unique ability to be procured in large chunks, which can be fashioned into blocks or used in natural crystal form, Himalayan Salt is largely prevalent in Salt Air Therapy. As you breathe air through the inhaler, it passes over the Himalayan salt crystals resting inside a chamber within the inhaler. Moisture in the air absorbs salt particles that then enter the mouth, nose, throat and lungs during inhalation which can aid in the treatment of conditions ranging from the common cold, sinus issues, congestion and fever to Bacterial Pneumonia, Asthma and Allergies. Saline solutions have been noted for ages for their ability to help with sinus conditions from runny noses to infections. 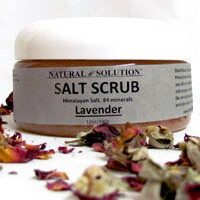 The benefits of these salt solutions are due to the antibacterial and antimicrobial nature of salt. Ancient Ayurvedic medicine, practiced in the Ayurvedic culture of India, relied on salt therapy to cleanse the nose and throat of bacteria, mucus and infection and to promote overall respiratory system health and optimal lung capacity. Breathing salt air, whether it be the salty sea air experienced near coastal areas or produced by Salt Air Inhalers, is reputed to benefit the respiratory system and aid in reducing symptoms of Allergies and Asthma. This natural therapeutic treatment causes absolutely no negative side effects, while Steroid inhalers and other pharmaceutical methods of treatment for these ailments may, and often do, cause adverse side effects. Gargling with a salt water solution has been known to reduce swelling and irritation associated with a sore or irritated throat and cough since antiquity. This natural treatment helps to reduce harmful bacteria, thereby treating and preventing infection with anti-bacterial and anti-microbial properties. Himalayan Salt Glasses provide a convenient method for preparing salt water solution for gargling, by simply filling the glass with water and allowing a few moments for some of the salt to dissolve into the water. This method provides a natural, pure salt solution for gargling with unprocessed salts which do not possess added iodide, caking agents or preservatives. A non-pharmacological therapy for sinus congestion and sinus infections, as well as allergic rhinitis, is nasal saline irrigation, a treatment which has been known for centuries to be effective in preventing and treating these conditions. The American Academy of Allergy Asthma and Immunology suggests saline sinus rinse as a treatment for chronic or acute sinus infections and allergic rhinitis, stating that irrigation of sinus cavities with salt can “bring relief by removing allergens from the nostrils and sinuses”. They also suggest using salts that contain no iodide, anti-caking agents or preservatives which can irritate the nasal lining. Some of the salts you can use to avoid these irritants are Pickling Salts or Himalayan Sea Salts, the latter being readily and conveniently available together with a device called a Neti Pot for this specific use. Salt Air Therapy is the process of breathing air containing dry, micronized salt particles which travel to all areas of the lungs providing a natural way to cleanse and maintain the respiratory system from within. This all natural, safe and effective therapy helps to reduce inflammation in the airways effectively reducing constriction in the sinuses and lungs that can occur with colds and flus, as well as asthma, allergies and other sinus conditions. By helping the body to naturally eliminate allergens and pollutants, Salt Air Therapy also helps to support the body’s immune system. This treatment is most effective when large quantities of time are spent inhaling dry salt air. Due to its rather unique ability to be procured in large chunks, which can be fashioned into blocks or used in natural crystal form, Himalayan Salt is largely prevalent in Salt Air Therapy. Himalayan Salt Caves have been constructed at many locations worldwide, including several in the US, for Salt Air Therapy. Patrons of these caves spend anywhere between 45 minutes to several hours in the caves in order to breath the salt air. However, it is usually not practical, or even possible, for individuals to travel to a salt cave on a regular basis, let alone stay for large quantities of time. 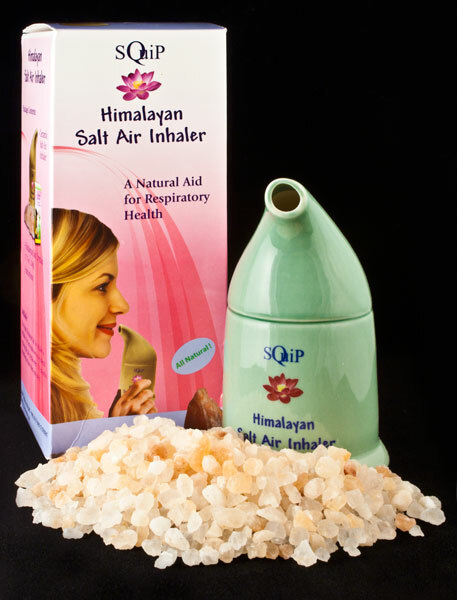 The most convenient and available method of salt air therapy is the Salt Air Inhaler, which is also readily found online and in stores accompanied by Himalayan Sea Salt. 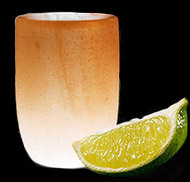 Himalayan Salt lamps, chunks of salt which have been made into lamps by installing a bulb inside of a hole drilled into the bottom of a salt crystal and mounted onto a wooden base, can also be placed around the home for increased exposure to ionized salt air. Proper irrigation of the ear canal with saline solution helps to cleanse the canal of wax and treat and/or minimize the risk of bacterial infection. This is best performed by mixing three parts of water with one part salt, then administering the solution to the ear canal via a bulb syringe. Again, salt which does not contain caking agents or preservatives should be used for this homeopathic treatment. Q-tips should not be used to clear wax from the ear canal due to potential damage to the ear drum; cleaning the ear canal with Q-tips can also push wax further into the ear. Most of these simple Homeopathic, Holistic and Natural salt treatments have been noted by many cultures since antiquity for their ability to effectively treat ailments and even prevent health issues from arising. Since these methods have been tried and tested throughout the ages for effectiveness, they are an excellent choice for those dealing with the symptoms of colds and flus, as well as the other ailments mentioned. Unlike other traditional treatments, these require no special knowledge of preparation or usage, allowing the use of these remedies by anyone who wishes to enjoy their benefits!